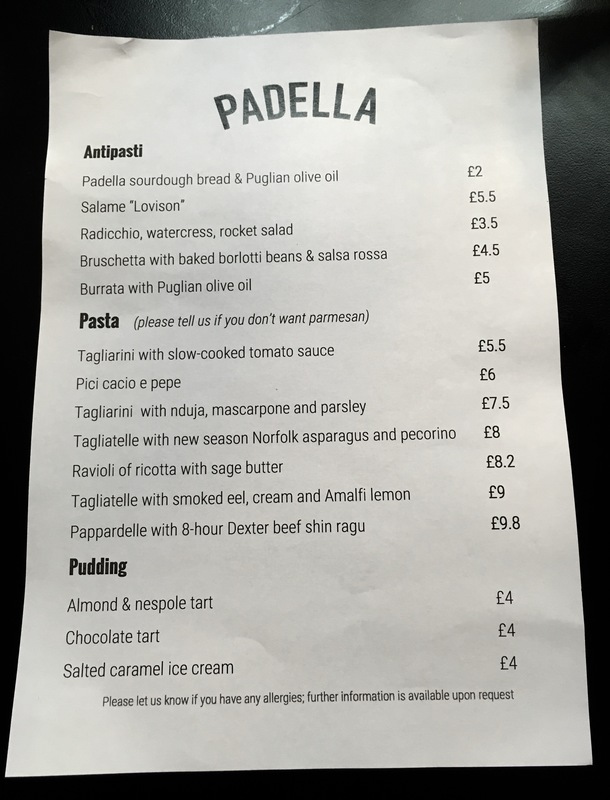 Padella in London Bridge was recently opened by the same brains behind Trullo (Ottolenghi trained chefs cooking seasonally focused Italian food). A smaller, less fancy Trullo, with no reservations taken and all dishes under a tenner, Padella does pasta in a big way. Despite our seemingly ever-growing fear of grains, pasta is no foe in my eyes. Filling, cheap, and damn right delicious, nothing quite fills you or the need for a hearty meal like pasta. And if it’s handmade fresh before your very eyes, served alongside classic Italian starters and desserts with negronis on the menu too? All the better. 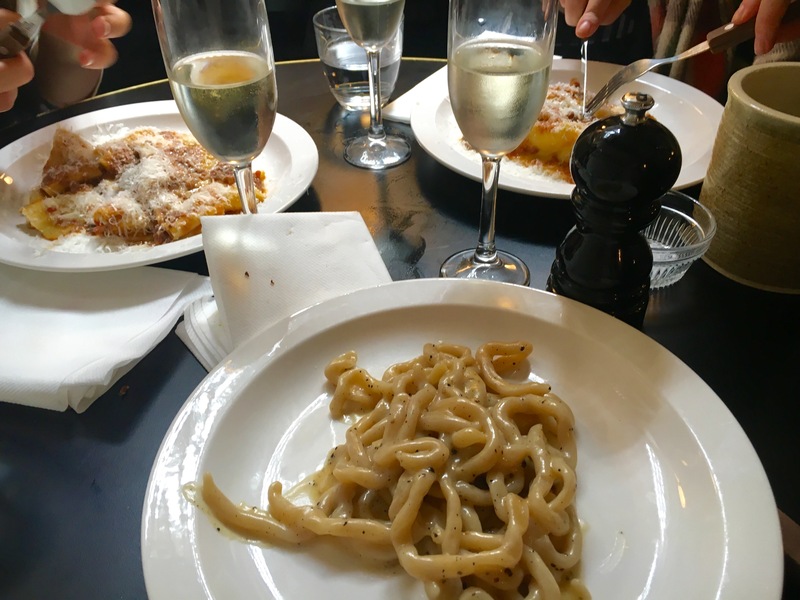 This Saturday I headed to Padella with two girlfriends to eat a pasta lunch. Making a day of it, we arrived earlier to beat the queues – you can’t reserve tables, so we came at 12 for the first sitting. We later nibbled our way around Borough Market, but before, it was time to sit and eat proper. The restaurant itself is clean and simplistic, with a black and white theme throughout. The compact restaurant consists of ground floor and basement level, with small tables and the majority of the seats around the bars on both floors. We looked to our waiter for starter suggestions, as although the menu in not extensive, we weren’t quite enough people to justify ordering one of everything (a crying shame, I thought). 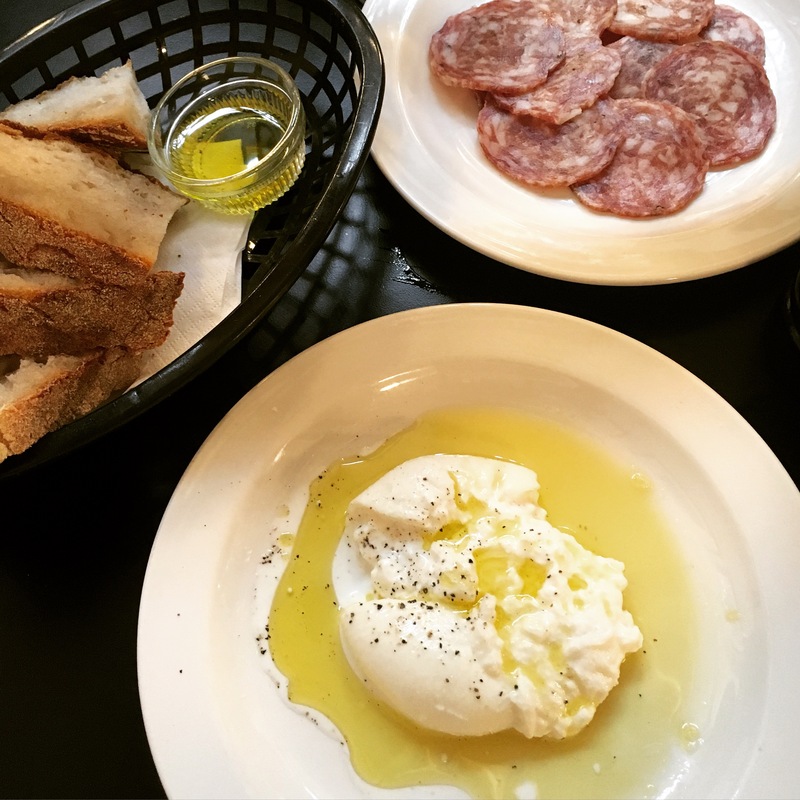 Freshly baked bread, soft burrata cheese and a plate of salami were our warm-up to the main event. A solid spread to sample Padella’s classic Italian offerings, the salami was smooth and creamy, with a touch of spice. Eaten alongside the soft warm bread topped with the meltingly rich burrata, these starters were a pairing made in heaven. Using the very last bits of bread to clear up the Puglian olive oil which once covered the burrata, we were clearly ready for our mains. I had been recommend the pici cacio e pepe pasta, which I understood to be a red pepper and cheese pasta; interesting, I thought. In fact, this dish was no more than noodle-esque spaghetti coated in melted cheese and black pepper. While it sounds very much like my university meal of choice, this was a world away from the basic overcooked penne with cheddar, butter and salt I ate far too often in student years. Despite its worm-like appearance, my pasta was perfectly cooked with just the right bite and a smooth, silken texture. The simplistic cheese and black pepper was almost all this pasta needed. I added salt, but then I like my food on the red-sea side of seasoned. The girls both went for the pappardelle pasta with 8-hour Dexter beef shin ragu, a dish on the menu of Trullo which has made it over. The pappardelle resembled longer, thinner lasagna sheets, and the rich tomato beef sauce nestled its way into the folds of these pasta ribbons, all topped with thinly shaved Parmesan cheese. Padella lives up to its great reviews. 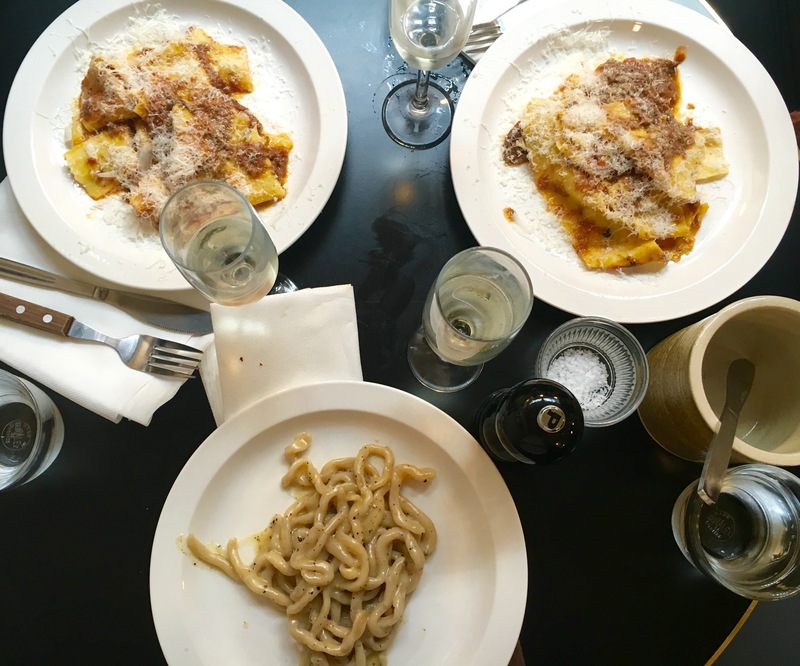 Friendly staff, accessible prices and pared-back traditional Italian food done right is a recipe for a winning restaurant. I’ll be returning without a doubt to try the rest of the mains, and also to taste their sweet tarts. However on this occasion, my sweet spot was met in Borough Market, just next door to Padella. Wandering around after lunch, despite my savory belly being full to the brim with pasta, my sweet section was on the look out for it’s next bite. When I saw a woman with a half eaten doughnut in her hand, eyes closed, mouth covered in sugar and exhaling noises of sheer delight, I felt my sweet treat could be in the vicinity. Asking her what thing of beauty she had eaten, she spoke through a mouthful of doughnut and told me to head to Bread Ahead Bakery. Although I’ve never been huge on doughnuts, when I come to think about it, I wonder…why? A sweet, fluffy bread with a gooey, sugary centre. An invention of genius! 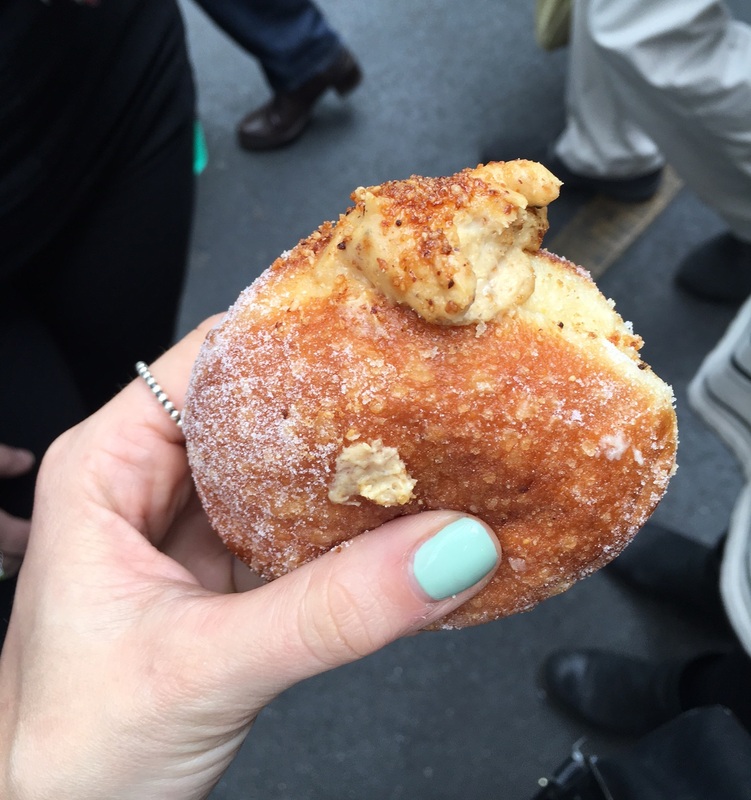 Sweeping past the regular old jam options, hovering over a lemon curd choice, I ultimately went for the hazelnut & praline filled doughnut- the size of a small rodent, I should add. 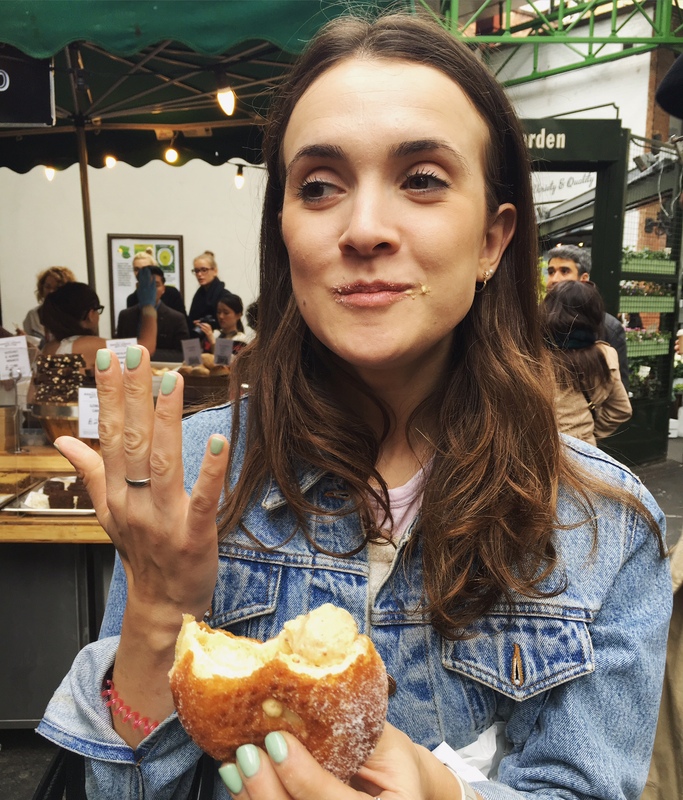 And all too soon I was that woman who I had spoken to five minutes earlier, stood in the middle of the market, mouth sugared and hands filled with this delicious doughnut. 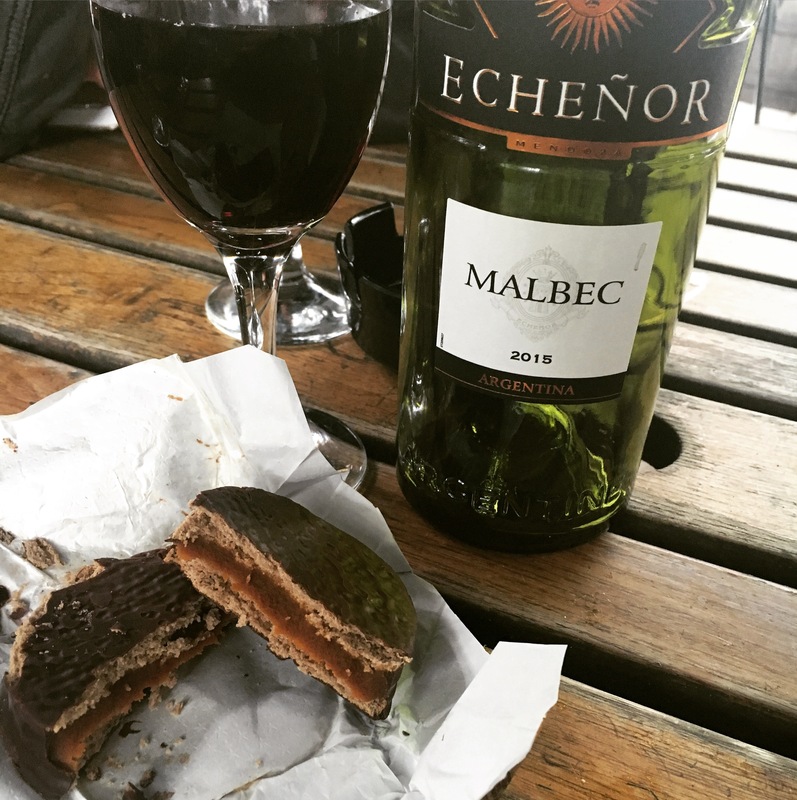 Alfajores y malbec…como si estuviera en Buenos Aires de vuelta! After another bottle of booze and yet more food, we decided it was time to put an end to the day’s indulgence. But go, induldge away, in all the pasta your heart desires (and belly can fit) at Padella, because it is fantastic.